HIGH-DEF FOR THE FIRST TIME! Revealing Bonus Content and More! A long time ago, in a studio far far away (actually 1980 in Venice, Calif.), Roger Corman gathered together a fledgling team of filmmakers to make one of the best low-budget science fiction films of all time, Battle Beyond the Stars, a space opera that managed to playfully borrow from Star Wars and The Magnificent Seven, to come up with an enduring cult classic. Long out of print, Battle Beyond the Stars has been meticulously restored with a new anamorphic widescreen transfer (1.85:1) from the internegative, boasting a new 5.1 DTS Master Audio soundtrack on the Blu-ray, and featuring a galaxy of extras, including commentary by writer John Sayles and Roger Corman; a new interview with actor Richard Thomas; a behind-the-scenes technical featurette and much more. 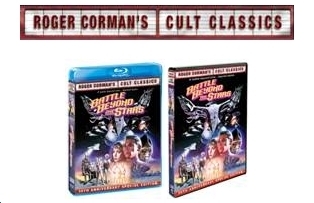 Roger Corman’s Cult Classics: Battle Beyond the Stars 30th Anniversary Special Edition is a must-have for fans of Roger Corman, science fiction enthusiasts and collectors — available July 12, 2011 on Blu-ray ($26.97) and DVD ($19.93) from Shout! Factory, in association with New Horizons Picture Corporation. Pre-order now on Amazon.com and major retailers. the Stars 30th Anniversary Special Edition from ShoutFactoryStore.com will receive an iron-on of the original Battle Beyond the Stars theatrical key art as a gift-with-purchase. Corman brought together some extremely talented people — who went on to bigger and better things — to make Battle Beyond the Stars. John Sayles (Eight Men Out, Lone Star) wrote the script, his third for Corman after Piranha and The Lady in Red; James Cameron, who went on, of course, to be king of the world with Titanic and then king of the universe with Avatar, handled the art direction and special effects; Academy Award®–winning composer James Horner (Titanic, Avatar) wrote the score, which he recycled two years later for Star Trek II: The Wrath of Khan. Also on hand as production manager was Gale Anne Hurd, who went on to produce The Terminator with Cameron as well as The Incredible Hulk and AMC’s The Walking Dead. What’s a small, peace loving planet to do when they’re threatened with destruction by a group of malevolent mutants headed up by the most despicable villain? Why they enlist a sweet young boy to travel the galaxy in search of mercenaries to fend off the tyrant. When the evil Sador the Conqueror (John Saxon) and his hideous Malmori army threaten the peaceful planet of Akir, the inhabitants, known as the Akira (in reference to Seven Samurai director Akira Kurosawa) sends young Shad (Richard Thomas of The Waltons) on an intergalactic journey to hire mercenaries to defend the planet. Piloting a sarcastic pre-LEXX talking female spaceship (with breasts! ), Shad assembles a fleet of seven spaceships to fend off the bad guys. five clones with a collective consciousness known as the Nestor; and a pair of aliens who communicate by emanating heat from their bodies. The “magnificent seven” mercenary ships — headed up by Shad and Nell — travel back to Akir for the final conflict. The cast of Battle Beyond the Stars also included Marta Kristen (Judy Robinson of TV’s Lost in Space), Jeff Corey as the wise old Zed the Corsair, Sam Jaffe as Nanelia’s father, and a very young Julia Duffy (Newhart and Designing Women). Made on a reported budget of $2 million, the film opened in late 1980 and quickly made back its investment. The film grossed $1.7 million on opening weekend alone. And the spectacular space battles and explosions were used over and over again in future Corman productions. Shout! Factory will continue to present Roger Corman’s Cult Classics home entertainment releases in 2011. Upcoming highlights include Melissa Leo in Streetwalkin’, The Bird Cage, Big Doll House, Women in Cages, and many others. Independent filmmaker-producer Roger Corman’s illustrious career ranks as one of Hollywood’s most amazing and legendary success stories. Having produced more than 350 films and directed 50 others, his influence on American film goes far beyond his own energetic, creative low-budget movies. He is arguably one of Hollywood’s most gifted and masterful filmmakers, and he chronicled his incredible true-life story in the best-selling, award-winning autobiography How I Made a Hundred Movies in Hollywood and Never Lost a Dime, written with Jim Jerome in 1998. In 2009 he was the recipient of an honorary Academy Award® for his contribution to the medium of film. Noted for his keen ability to spot young talent, Corman’s most lasting legacy will undoubtedly be the legion of producers, directors, writers and actors he has fostered, among them: Jack Nicholson, Francis Ford Coppola, Robert De Niro, Martin Scorsese, James Cameron, Ron Howard, Peter Fonda, Jonathan Demme, Robert Towne, Gale Anne Hurd, Diane Ladd, Tommy Lee Jones, Sandra Bullock, Bruce Dern, Talia Shire, Charles Bronson, Joe Dante, Peter Bogdanovich, Dennis Hopper, Bill Paxton, Monte Hellman, Carl Franklin and Sally Kirkland. Picture Arts & Sciences. Grammy® is a trademark of the National Academy of Recording Arts & Sciences, Inc.